When you request dental implants in Waco, you want to have as much confidence as possible when it comes to their success. According to your implant dentist, he couldn’t agree more. That’s why he utilizes the most advanced technology available to make the process a success every time. One piece of tech he loves to use is the CT/Cone Beam Scanner. Before any implants or placed, your dentist will have you scanned by this machine first. Here’s why. What is a CT/Cone Beam Scanner? While digital x-rays are incredibly useful, they can only give your dentist so much information. A CT/Cone Beam Scanner (CTCB) is essentially a large scanner that offers more detail than any other device in the office. Through the use of imaging software, the scanner creates a panoramic, three-dimensional X-ray of more than just your teeth. It also scans your jaw, skull, sinuses, and facial nerves. While a 2-D radiograph is ideal for examining the health of your oral cavity, your dentist prefers a more comprehensive image when performing oral surgery. How Does It Help with Dental Implants? 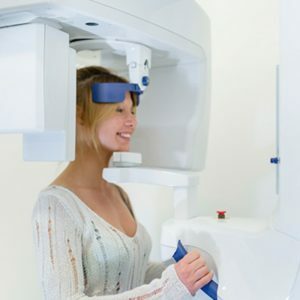 Since the CTCB scanner takes such a detailed picture of patients, it allows your dentist to build a better treatment plan when placing dental implants. Dental implants in Waco are considered an advanced oral surgery that requires more planning than typical oral surgery. A larger part of that process is determining where certain parts of your mouth are, so when your dentist begins surgery, there are no surprises. It’s very important that your dentist has an exact anatomical picture of your jaw and tooth roots before performing any surgery. According to your dentist, the CTCB scanner provides higher success rates. Factors like bone density, width, height, and jawbone thickness are important when determining eligibility. It also helps him determine how long the implants need to be to integrate with your existing bone. Reap the Benefits of Dental Implants in Waco! When you choose dental implants from your dentist in Waco, you don’t have to replace only a single tooth either. Implants can also support a bridge to replace multiple teeth at once. In fact, you can replace an entire row of teeth by getting implant-retained dentures. Whether it’s a full or partial, an implant-retained denture can restore your entire smile! Don’t hesitate to rebuild your smile using the best technology out there. Schedule a free consultation with your dentist today! After Dr. Rick Cofer earned his Doctor of Dental Surgery degree from Baylor University, he began continuing his education on dental implants. Today, he’s gained nearly 200 hours on education regarding dental implants alone and rebuilt hundreds of smiles, all within his own practice. To learn more about the technology he uses or about his practice, contact him at (254) 732-0309 or visit his website. by: Dr. Rick Cofer at May 2, 2018 .